Firstly, can you tell us a bit about yourself, your instrument and your training to date? My musical life started with the violin, and until I was at University, my heart was set on becoming a professional violinist – but this wasn’t to be. At the age of 7 I became a chorister at Westminster Abbey, and this was really the catalyst for what I do now – the training at the Abbey was of the highest standard, and, even at a very young age, I was expected to deliver professional performances on a daily basis. It was the rigour and discipline of this early training which has enabled me to become a professional musician. I first encountered the harpsichord when I was in my teens which I studied alongside the violin as my second study. By the time I reached the end of my time at Manchester University, I realised that I was also passionate about conducting, particularly in the field of early music. On returning to London as a freelance musician I became Musical Director of Hampstead Garden Opera. During a production of Blow’s ‘Venus & Adonis’, one of the cast asked me to accompany her for a coaching session with John Eliot Gardiner. John Eliot subsequently asked me if I’d be interested in the Monteverdi Choir Apprenticeship. For a year in 2010, I was their keyboards apprentice playing harpsichord and chamber organ in the English Baroque Soloists. Without a doubt, this was the most challenging and exciting experience of my musical life. What other music ensembles/orchestras are you currently involved with? I continue to work with John Eliot Gardiner and as a member of English Baroque Soloists and the Monteverdi Choir. I also played continuo with His Majesty’s Sackbuts & Cornetts, the Little Baroque Company, the London Mozart Players and the Orpheus Sinfonia. I’m very excited to be playing continuo with Stile Antico in 2017, including a concert at the Wigmore Hall in May. This has to be during my first time at the BBC Proms in 2010. 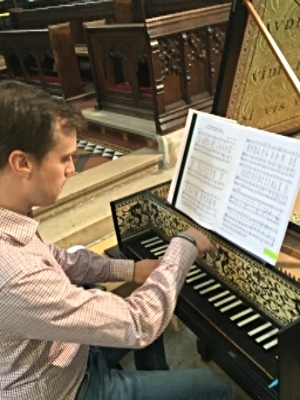 I was playing harpsichord and chamber organ in the Monteverdi Vespers with John Eliot and the EBS and it was televised and broadcast on the radio. All was going well until I had to leave the stage to climb up the many stairs to the top of the Albert Hall. Up there was placed a small chamber organ and the boys choir of Cardinal Vaughan School. This was for one verse of the Ave Maris Stella, a matter of seconds, but the small organ was to be the only instrument accompanying the boys choir – my presence up there was fairly crucial! e organ in the nick of time. There were some bemused faces amongst the Prommers in the gallery as I weaved my way through them in my tails and socks! And finally, what are some of your ambitions in the musical world? I am delighted with the progress Musica Poetica has made over the last couple of years. My ambition is that we establish ourselves as an early music ensemble of renown and quality, which stands the test of time. It is a great inspiration to see several superb early music groups making great waves in the musical world – I hope we can do the same.